The novelty of making a Thank You presentation in 20 languages is a unique gift. Applications do include company gift, organization or client presentation gifts. with your logo imprinted all packaged in the unique Thank You Box. You MUST order the glassware set in whole cartons of 12 units. SafePack Cartons required add $7.00 per 12 unit carton. Price includes one color imprint on each glass in area 3 1/2" w x 2 1/2" h.
color add a setup & a running charge $2.00 each set. 4CP Imprint is available on this glassware. 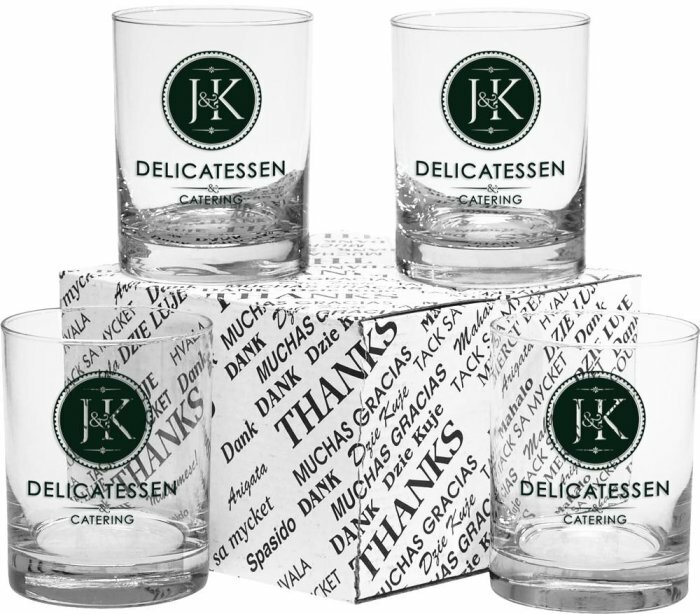 I ordered the Thank You Gift Sets for distribution to our better customers for this Christmas as business gifts. The box, glasses, my logo looked wonderful. Also they packaged the boxes/glasses in protective cartons so not a one was broken upon delivery. I have say I am impressed with Promotional Items, Inc. and my customers were impressed with our company gifts. Absolutely a happy and satisfied customer.